so i ventured out with my good friend Jay to try and figure out this whole Halloween costume thing... normally, by this time, i already have my costume and everything set up. i'm waaaaaaaay late this year and i'm SO annoyed with myself (i'll take any suggestions you may have)! we laughed at this one for a while. it was amongst the various "rasta" accessories. 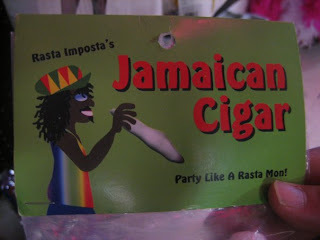 please note: "Rasta Imposta's: Jamaican Cigar, Party Like A Rasta Mon!" 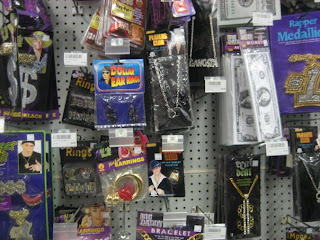 a plethora of "gangsta" stuff... dollar sign medallions, 4 finger rings, grills and fake cash to "make it rain"... it's just an endless variety of accessories for your very own do-it-yourself BET moment! 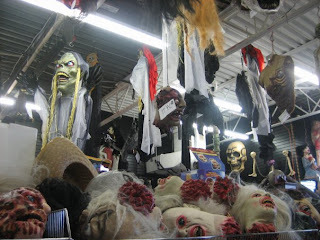 4 more days till Halloween... wish me luck! you should just be a rasta gangsta. obviously it would be easy to find your costume. i knew i was your friend for a reason. haha!